And some of these are jobs you wouldn't expect to come with great travel benefits. If you're thinking of switching careers, here are the top 10 jobs you should look into if you want to see more of the world. You would not think a job in the financial sector would involve so much traveling, but auditors are out there as much as international jet setters and professional athletes. An auditor's job is to make sure than any given organization is utilizing its resources efficiently, whilst complying with all financial laws and rules. Every public company must, by law, undergo an annual audit. And these public companies are everywhere. As an auditor, you will travel to these companies, spending several weeks combing through the files and procedures. That's several weeks at a time that you get to spend in a city or town that is not where you call home (though beware, they're not always exactly glamorous locations). The people most in need of help with English skills are those not living in English-speaking cities and countries. So an English teacher, or ESL (English as a Second Language) instructor, must be prepared to travel all over the world helping people to speak the language. Many ESL teachers not only get free travel benefits, but free accommodation and even free meals. There are even opportunities to work on military bases, if that's something that interests you. When you're not teaching English, you're taking in the local sights and sounds on someone else's dime. Au pairs are usually hired by wealthy couples that both work full time, and require help with their children. The job can take you all over the world, working in France one year, and Australia the next. Room and board is usually given to you as part of the job, along with a salary and other benefits. The downside is that most of your time will be taken up by caring for another family, but if you're young and single and want to see the world at little cost to you, this is a great place to start. If you are very good with a camera, the world is your oyster. Sure, the world's best photographers are in demand everywhere, but you don't have to be Annie Leibovitz or David Bailey to travel the world in style. One of the best areas to go into is entertainment photography. Movies and TV shows are filmed on location all over the world, and as a unit photographer you will be required to take still shots of the action as it's being filmed. The benefits, other than free travel and accommodation, are obvious. You get to be on the sets of some of the biggest shows and films in production, seeing them long before they come out in theaters. Your food will be supplied on set every day. You'll also get to hang with the cast and crew. This is a great job that most people don't even know exists. Wherever there are hotels, there are hotel inspectors. And there are hotels all over the world. Hotel inspectors are required to stay in places that run from Five Stars all the way down to Zero Stars (the ones that look more at home in horror movies than travel brochures). However, for the most part the hotel inspector will spend most of his or her days on the road, going from hotel to hotel, and rating the food, accommodations, customer service, and cleanliness of each hotel. This will involve flying to some parts of the country, and everything on the trip is paid for. You also have to be a master of disguise. As one hotel inspector noted, "A hotel can scramble to clean up its act in seconds if it knows an inspector is checking in, and it's always a battle to make sure no one is on to me. That's why we disguise ourselves. I used to grow a beard every other year. One inspector I know dyes her hair. Another uses fake glasses. 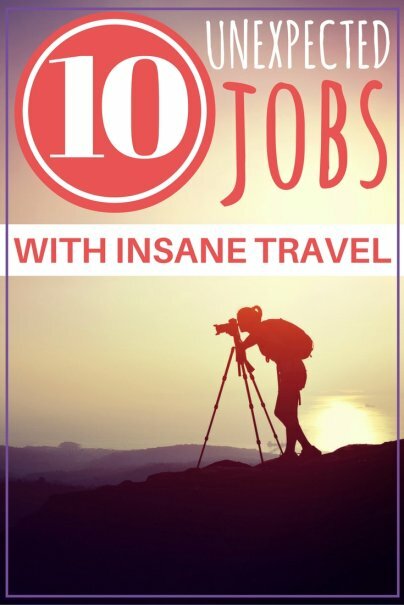 To keep my cover, I'll pay with credit cards that I've taken out in made-up names…"
Obviously travel writers get the most gigs, but you can find a variety of writing jobs that come with a heavy dose of free travel. If you're a food writer, you'll have to go to the many different places around the world that serve the latest foods (which you will also be reimbursed for). If you follow sports teams, you will be on the road as they go to their various engagements. If you cover entertainment, you'll be in New York one day, and Hollywood the next. Yes, it's not an easy career to break into, but once you get a gig at a major publication, you can expect a lot of your time to be away from the office. Writers have to experience life, not read about it on the Internet. Advertising and PR may not be what is was in the eighties, but it's still a glamorous profession in many ways. As an account executive or PR employee, you will often have to travel around the country, or the world, to meet with clients and liaise with local press outlets and print shops. Once again, any travel you go on will be covered in full by the company, and that includes food, hotel bills, and anything else you need to live your life while on location. As a scout in the sports industry, you need to find the best talent all around the country. Whether it's baseball, basketball, football, hockey, or soccer, you must be out there all the time making sure you get to the best talent before anyone else does. Some scouts work exclusively for one team, others freelance for several. As you go from college to college, and city to city, all of your travel and accommodation is paid for by the professional teams you're scouting for; and these teams are not exactly hurting for money. True, you'll have to sit through a lot of games, but if you do this for a living you'll love the sport anyway. Getting paid to travel the country watching sports? That sounds good to most people. Every music gig you've ever been was made possible by the crew of roadies working tirelessly behind the scenes. The roadie, or technical support staff, is responsible for helping the bands set up for a gig, and tear down after it. It's by no means an easy job. There is a lot of lifting and carrying involved, and there is often a need for musical ability or knowledge, especially if you're going to be tuning instruments for the band members. But the perks… oh, the perks. For a start, you're going to be traveling with some big names in rock, pop, metal, and every other genre that does nationwide (and even worldwide) tours. You will be on the road constantly, traveling from town to town, city to city, and country to country. You get to eat and drink well, and rub shoulders with the rich and famous. And you don't even need formal qualifications or training. Due to the nature of the job, the FST has to go to the equipment, not the other way around. It could be elevator repair, heavy-duty equipment maintenance, or even train engine repairs and rebuilds. As a FST, you go where the work is, and you get paid to travel, stay in hotels, and get your per diem for meals and other expenses. Many companies offer on-the-job training too, so you can become qualified as you travel. Have you held any of these or other jobs with a lot of travel? Please share in comments!